If there is going to be a particularly hot spell in the London summertime, tradition dictates that it will coincide with the Proms season’s most popular concerts. And thus it was this year, with heatwave peaking for the Proms’ first (and entirely sold-out) full Ring Cycle, under Daniel Barenboim. I know a few hardy types who not only did the whole cycle, but with standing tickets, but I’m afraid I just went to one of the four, and got a seat for it. (I did consider doing the lot, but I’m a bit Siegfrieded-out this year, and Götterdämmerung clashed with another event.) Now, the Albert Hall’s air conditioning has improved considerably in the time I’ve been going there, and the place was pleasantly cool at the start, but over the next few hours it proved no match for the combined heat of a few thousand Wagner fans. I didn’t care. The performance was fantastic, rising far above any superficial bodily discomfort, and I was so glad I’d gone to hear it in person. I’ve commented before on the special nature of being in the same physical space as live acoustic music, with nothing but vibrating air between the instruments and your ears, and this was a prime example. In some other people’s reviews I’ve read a few negative comments about Barenboim’s extremes of tempo and dynamics, and apparently some kind of intra-orchestral disagreement going on at one point, but no untoward incidents were visible from Row T of the amphi (the area where I’m usually to be found – back centre), and I can report that the dynamics were so perfectly judged – the pps as soft as they could be without ever slipping into inaudibility – that they must have had somebody in the back row for the soundcheck. As for the tempi, well, with such beautifully-realised orchestral colours and textures, who wouldn’t want to luxuriate a little? I didn’t mind. I won’t go into great detail about individuals, but can report that (IMO) Bryn Terfel still owns Wotan, Nina Stemme is a totally kickass Brunnhilde, Eric Halfvarson continues to do a good line in Nasty Bass roles, and Ekaterina Gubanova’s lovely tone and expressive, musical phrasing almost won me over to the frequently-dislikeable Fricka. Anja Kampe and Simon O’Neill were solid as the star-crossed twincest couple. Orchestra prize of the night is for the delicious solos of the Staatskapelle Berlin’s cor anglais player (NB: Anyone know the name, so I can include it? I didn’t have a programme), with bass clarinet and oboe as runners up. Piccolos – very nice, but I wanted to hear MORE of you in the mix. Anyway, big hugs to all. I’m not the biggest fan of strings-only music, but if I’m going to listen to the stuff, I think I want it played by the Britten Sinfonia. Let me clarify that. Listening to consort music, where you have a bunch of basically the same instrument in different sizes, whether it’s strings, recorders, saxophones, or whatever, is like watching black and white films. Yes, it can be very beautiful, and there have certainly been some masterworks created in that medium… but colour is important to me, and after a while I find myself yearning for a splash of red, or an instrument from a different family. Does that make sense? Nevertheless, the BS strings (under Sian Edwards) combined careful attention to detail with such vibrancy, and precision with verve, that I didn’t mind at all that they’d left the other half of the orchestra at home. First up was Britten’s Prelude and Fugue – a new piece to me, but an instant hit. (In fact, weirdly, it sounded almost exactly the kind of music I was unsuccessfully attempting to compose while at university, until the composition tutor told me not to bother.) Holst’s St Paul’s Suite – ach, they really did their best to give the thing life, but it’s just dull music. I do not like a folksy jig (well, unless I’m one of the ones playing it, and it’s being taken insanely fast – at which point they can become quite fun). The last string piece, Tippett’s Fantasia Concertante on a Theme of Corelli was a bit clever-clever, but did contain some lovely bits, particularly in the duets between leader and principal 2nd (I think – again, no programme, no names). And the vocal works, where I got my wish of something non-stringed thrown into the mix. Lennox Berkeley’s Four Poems of St Teresa of Avila really do deserve to be played more often, and what a great piece is Britten’s Phaedra! Sarah Connolly, whom regular readers will know I like quite a lot, really has become Queen of psychologically-troubled classical anti-heroines. Taking a day out in between her Glyndebourne performances as Rameau’s version of the role (Phèdre, in Hippolyte et Aricie) (read her talking about it here), in 15 brief minutes, she nailed the character in all her splendidly violent emotions. It’s not often I leave a concert and can’t wait to hear a piece all over again, but thanks to the magic of BBC iPlayer, on this occasion I can do so. And suggest you do the same, while it’s still up. All of the good things about Nigel Kennedy concerts, and none of the bad. Spirited iconoclastic solo and orchestral playing, a fresh and unique twist on a long-beloved piece (with lots of additional material, but – importantly – no movements left out), proof of the existence of that rare thing: Good Crossover music, no bloody electric violin in earshot, and minimal talking. Loved it. My full review is here. Tonight’s Orchestre de Paris Prom was very much a concert of two halves, in the first of which they got to show their sensitive, introspective side, reflecting on the nature of life and lamenting too-early death, then becoming considerably more extrovert in the second for some free-spirited buccaneering, and what the programme notes describe as “vivid, prolonged and grand noise”. It was, in fact, rather like attending two short concerts back-to-back – and both equally good, in their different ways. * Ok, I did curtly shush the adult couple chattering behind me. Long-term readers may remember that appreciating Britten’s music has been something of a late, slow progress for me – although I am very definitely getting there. Gloriana was a completely new one for me; all I knew was that it was about the first Queen Elizabeth, and written to commemorate the coronation of the second Queen Elizabeth. And Tudor history is not my forte (deriving mostly from TV’s The Tudors and Blackadder). Before it began, I glanced briefly at an already-discarded programme, just to remind myself who was actually in the cast. Bad ROH. 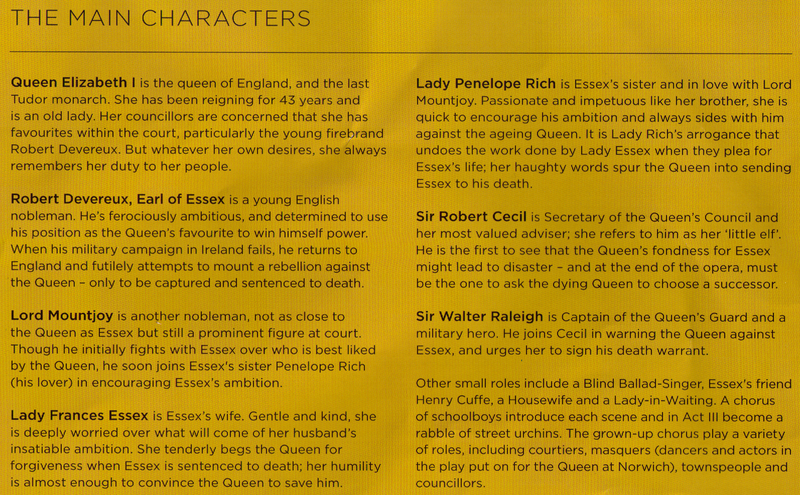 Even a brief glance told me how it all ends for main character Robert of Essex (badly). I prefer not to be told the ends of stories beforehand, I preferred this when I was a schoolkid, and I bet many current schoolkids prefer it too. Obviously audiences are very able to appreciate dramatic tension and a well-turned plot even when they know the story inside out, but on the occasions when one gets a chance, not knowing what is going to happen does, you know, add extra excitement. Oh, and it doesn’t actually even have the damn cast list in. If I was a schoolkid and heard a singer I liked the sound of (or for that matter, the look of – and yes, I can see Toby Spence appealing to a few) I might just want to know what their name was. Happy to report young audience did not find an innocent woman’s public humiliation very funny. Attending court were also wife Lady Essex (a luxurious Patricia Bardon), sister Lady Rich (Kate Royal), and several gentlemen of the lower-voice varieties, all of whom I particularly enjoyed: the equally ill-governed Lord Mountjoy (Mark Stone), slimy Sir Cecil (Jeremy Carpenter) and a somewhat camp Sir Walter Raleigh (Clive Bayley). I believe the moments of somewhat hammy acting were a deliberate part of Richard Jones’s production, which was a play-within-a-play concept of a 1950s amateur/school production. A shrunk stage area was surrounded by institutional painted walls, town/school hall style, with radiators, etc., visible pulleys and modern-dress stagehands for scenery-shifting, and visible ‘offstage’ musicians. There was a second level, with people up in some kind of viewing gallery, but it wasn’t possible to see what was going on up there from amphi row G. This concept was not at all objectionable, but for the most part it didn’t really add anything to my enjoyment of what was happening on the inner stage – I expect there were some clever references and in-jokes intended for those that remember the 1950s/coronation that passed me by. * Happy to report the gasps of horror and awkward embarrassed giggles from the young audience. They definitely know this kind of depiction of ethnic minority groups is Not Ok.
During the interval, considerable time passes. Both in the story and literally, as herding teenagers is akin to herding cats. Audience behaviour, surprisingly good at the start, had deteriorated once into the second hour of the first half, and was not improved by the break – although their moods were clearly improved by the addition of refreshments. My mood was not improved by a significant increase in rustling of crisps and sweet wrappers and chattering. However, showing remarkably good taste, they all quietened down for Brindley Sherratt’s cameo as the Blind Ballad Singer. That’s authority. 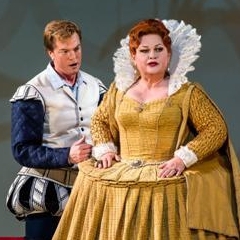 As bass roles go, it’s not exactly one of the greats – one intentionally disjointed and somewhat humorous Beckmesser-esque number – but nevertheless always a pleasure to hear his voice. Although I’ve said above that the singing was generally very good indeed, in this work I found – as I often seem to do with Britten – that the instrumental parts held more interest for me than the vocal lines. I wonder if this is one of the reasons some opera fans dislike him? There’s a certain kind of fan who is ONLY interested in singing, and prefers orchestras to stick firmly in subservient accompaniment mode, and either become jealous whenever the composer’s focus is on giving beauty and complexity to the non-vocal instruments, or get bored because they don’t listen to individual instruments. (Just a hypothesis – please disagree in the comments if you wish!) Anyway, I was listening to the orchestra, and upper strings, your pianissimi were spine-tingling; trumpets, you were fiery; flutes and oboes, you know I love you, and yes, I did notice and appreciate the contrabassoon solo. All round, the orchestra (MD’d by Paul Daniel) were excellent, but I thought most effective of all during the final scenes (when not disrupted by brats), and during Mountjoy and Penelope’s tryst scene, beautifully evoking the rippling river, in contrast to the (deliberately) clumsy boat-on-a-rope on stage. Britten really does do wonderful water writing – any scenes involving seas or rivers. No, no, no. 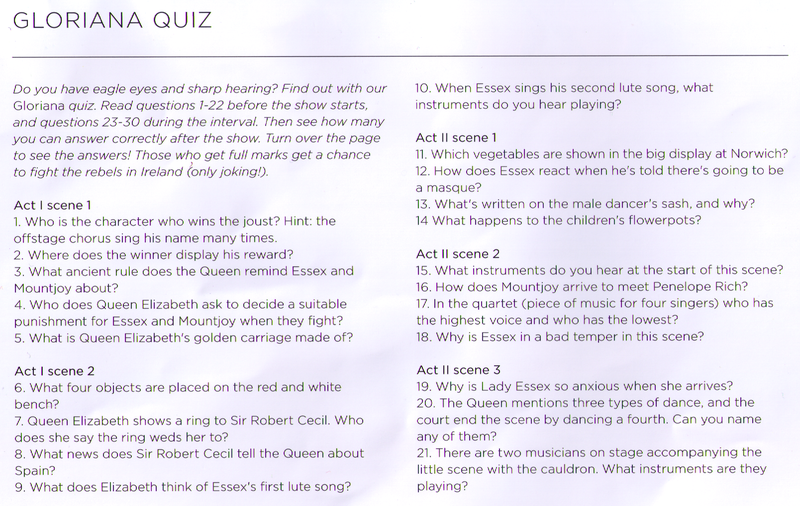 Read questions before the show starts, and then look out for the answers during the show? I thought the intention was to give young people the opportunity to experience opera, in the hope that they will enjoy it, and maybe become interested in the art form, perhaps even future paying audience members? How can you possibly immerse yourself in a performance and be moved by the music and drama if you’re thinking about finding out and remembering the answers to a load of annoying questions on a worksheet? I sincerely hope all the teachers chose to ignore this, or at least used the questions only as potential discussion points in a subsequent lesson, rather than a competition to find out which of their pupils found playing remember-the-objects-on-the-table, identifying vegetables from a distance, or keeping a close watch on the flowerpots, more engaging than the performance.